When it’s time to get pampered, Unique Nails is a full-service nail salon offering complete nail care and waxing services at affordable prices. We have the experience and skill to give you beautiful nails and we use top-of-the line products, including Shellac and Solar Nails. Whether you’re looking for a manicure, pedicure, or a new set of fingernails, we provide you with a relaxing, friendly atmosphere for your nail care needs. In addition to nails, our nail salon also offers complete waxing services to bring out a more beautiful you. 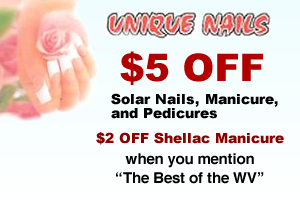 We are the local nail salon of choice in Linn County. TheBest Testimonial: I have tried many different ways to do my nails, and until I tried Unique Nails, FINALLY found the solution... SOLAR NAILS. They are beautiful, lasting, and durable. I now recommend them to all my friends! PS: I haven't found any place else that does them!